Pure diamond consists of carbon atoms in a perfect crystal lattice. But remove a few carbons and swap some others for nitrogen, and you get a diamond with special quantum-sensing properties. These properties are useful for quantum information applications and sensing magnetic fields, and as a platform for probing the mysteries of quantum physics. When a nitrogen atom is next to the space vacated by a carbon atom, it forms what is called a nitrogen-vacancy (NV) center. Now, researchers have shown how they can create more NV centers, which makes sensing magnetic fields easier, using a relatively simple method that can be done in many labs. They describe their results this week in Applied Physics Letters. Magnetic field sensing presents a prime example for the importance of this sensing. Green light can induce the NV centers to fluoresce and emit red light, but the amount of this fluorescence changes in the presence of a magnetic field. By measuring the brightness of the fluorescence, diamond NV centers can help determine magnetic field strength. 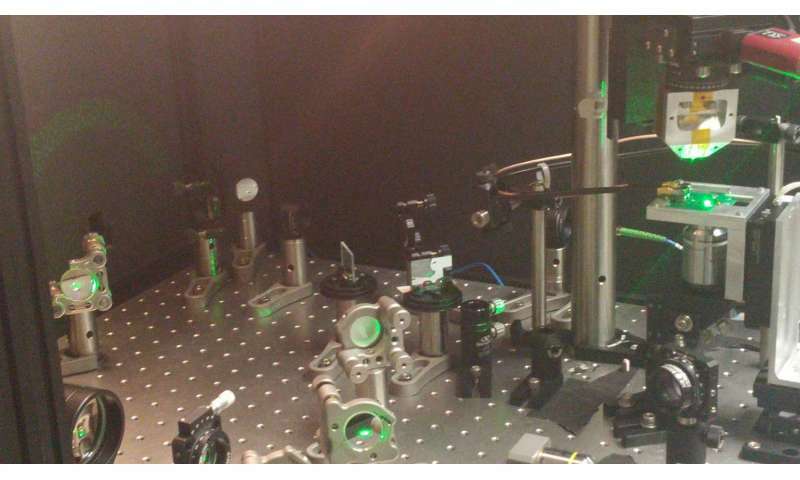 Such a device can make magnetic images of a range of sample types, including rocks and biological tissue. The sensitivity of this type of magnetic detection is determined by the concentration of NV centers while vacancies that are not paired with nitrogen create noise. Efficient conversion of vacancies into NV centers, therefore, as well as maximizing the concentration of NV centers, plays a key role in advancing these detection methods. Researchers typically purchase nitrogen-doped diamonds from a separate company. They then bombard the diamond with electrons, protons or other particles, which strip away some of the carbon atoms, leaving behind vacancies. Finally, a heating process called annealing nudges the vacancies next to the nitrogen atoms to form the NV centers. The problem is that irradiation often requires sending your sample to a separate facility, which is expensive and time-consuming. "What is special about our approach is that it's very simple and very straightforward," said Dima Farfurnik of the Hebrew University of Jerusalem in Israel. "You get sufficiently high NV concentrations that are appropriate for many applications with a simple procedure that can be done in-house." Their method uses high energy electron bombardment in a transmission electron microscope (TEM), an instrument accessible to many researchers, to locally create NV centers. Normally, a TEM is used to image materials down to subnanometer resolutions, but its narrow electron beam can also irradiate diamonds. Others have shown TEMs can create NV centers in specialized diamond samples, but the researchers in this study successfully tested the method on several commercially available diamond samples. In a typical, untreated sample, less than 1 percent of the nitrogen atoms form NV centers. But by using a TEM, the researchers increased this conversion efficiency to as high as 10 percent. In certain cases, the samples reached their saturation limit, and more irradiation was no longer effective. For other samples, however, the researchers didn't hit this limit, suggesting that additional irradiation could boost efficiencies further. 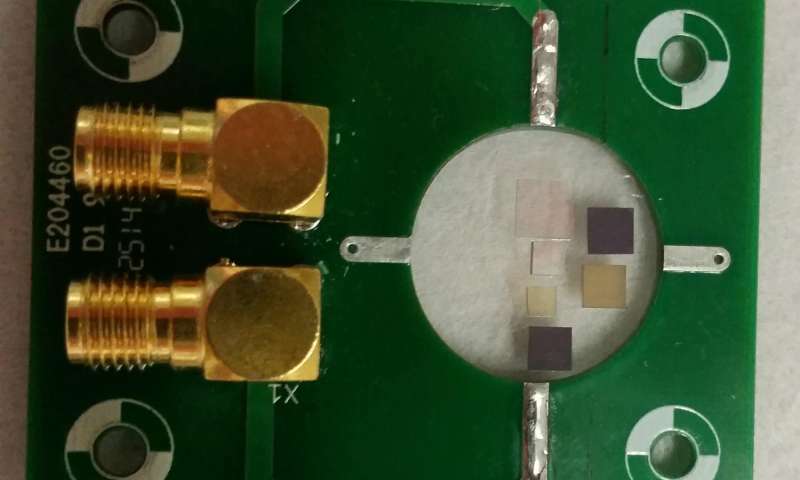 With higher conversion efficiencies, and small irradiation volumes possible with a TEM, devices like magnetic sensors could be more compact. To make sure the method didn't hinder the effectiveness of NVs in applications like sensing magnetic fields, the researchers confirmed that the length of time the NV centers remain in their states—the coherence time—didn't change. Packing enough NV centers in a diamond would allow physicists to probe the quantum interactions among the centers themselves. This research could enable the creation of a unique quantum state called a squeezed state, which has never been demonstrated before in a solid and could push the sensing capabilities of these systems beyond today's classical limits. "We hope the enhanced number of NV centers due to irradiation will serve as a stepping stone for this long-term and ambitious goal," Farfurnik said.